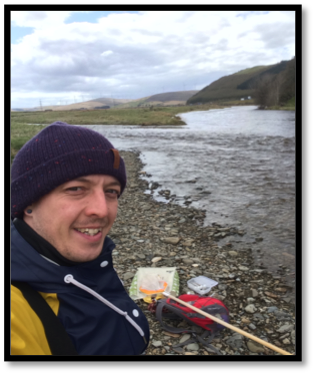 This week Dispatches from the field welcomes Arron Watson, who conducted his masters by research in Entomology at the University of Reading. His summer project was to investigate how signal crayfish, an invasive species, has an impact on benthic invertebrate predation. He sampled 20 sites across the UK, 10 without signal crayfish, 10 with. He conducted this field work over a month in May and is telling us about his experiences here! May 1st 2018: the first day of field work for my summer thesis, a key part of my MRes in entomology at the University of Reading. I had already spent roughly six months planning my field work, and decided that I wanted to start my freshwater exploration in Scotland. My supervisor from Buglife, Scotland is based in Stirling and he had offered to show me some advanced insect identification techniques. 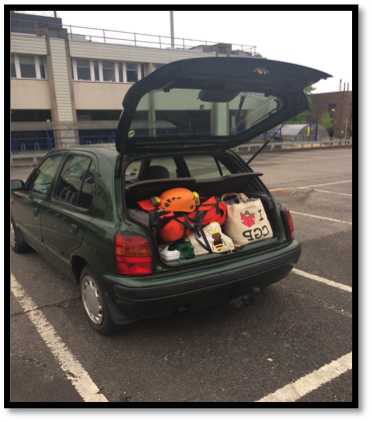 Next, I would drive over 1000 miles around the rest of the U.K. in my 1997 Nissan Micra (aka “the beast”), stopping over in a mix of locations including a hotel and the houses of friends I had met in my previous life as a back packer. I left Reading at 6 am and headed north up the backbone of the country towards Scotland. I have lived in Reading for about 3 and half years now, so I have gotten used to the urban way of life. In Reading, I see buses much more often than I do trees or sheep. But driving along on a beautiful day with a wad of CDs was fantastic, and the closer I got to Scotland, the greener the landscape appeared and the more free I felt. I met Craig (my supervisor) in Stirling. He suggested getting some rest after my 7 hour drive, then setting out first thing tomorrow for a set of four rivers to start my sampling. If you’ve never had the chance to “kick sample” before, it’s a lot of fun. It’s one of those things that takes you back to being younger: standing in the middle of a flowing river, dipping your net in, and waiting for living things to end up in there. When you remove the net from the river and you see lots of things wiggling about, you think, excellent! After collecting the samples, the next step is to sort them. This is where the skill comes in: not only do you have to remove the things you don’t need (such as fish), you also need to identify things based on differences in morphology – without books, depending only on your memory. But Craig also told me just how many different stone flies and mayflies there are, and explained that I wouldn’t be able to tell them apart just by eye, so I should be strict if I thought I collected everything. Luckily for me, I already had experience identifying terrestrial invertebrates, which was a huge advantage, so after a day’s training, I was a professional picker. Now my task was to collect samples from the rest of my sites, spread across the UK. I would spend the next 3 weeks having limited contact with anyone other than my hosts at each accommodation. Kick sampling methods used by the environment agency. My next set of sites were on the Clyde river in Scotland. I was informed to take a letter with me to show any catchment officials or anglers I had permission to be there. I arrived at my first site and started to get a feel of what it was like to be in the middle (not literally) of Scotland. Water running fast, no one in sight, greenery everywhere: bliss! As I got to the edge of the riverbank to look at my first GPS location, I took a minute to stare at the flow of the river and thought, “Oh! Actually that looks like it’s flowing quite fast.” I looked around and realised I really was alone. This is where you start to build field work skills, I realized: no one to rely on, no one to ask, “do you think I will get swept down the stream?” – just your skills and intuition to rely on. After a moment of worry, I told myself, “OK, if I go down that river, I have my buoyancy aid and an inflatable bag which has my phone in it, so I suppose I would be noticed flying down the river like a game of ‘pooh sticks’” (look it up!). I used the pole of my kick sampling net (approximately 1m) to gauge the depth of the river, chose an area where the flow broke slightly, and stepped in. Within a short space of time I had picked my samples, and off I went to Edinburgh to see an old friend. We had a few beers and the following day I headed down to East Yorkshire. I started to feel like things were going really well. My samples were being kept cool in ethanol, the car was running well, and there were no issues so far. It wasn’t until I arrived in Norwich a week later that I would experience my first major problem – which really couldn’t have been controlled or pre-empted. I had driven to Kings Lynn, heading for a river at the bottom of some farmer’s fields – which was nothing unusual. I found the location and got ready as usual: throwing my waders on, connecting the buoyancy aid connected to my belt, and grabbing my net. As I started to walk down the road, out of nowhere a farmer’s truck drove past me with a carriage of cows. It didn’t faze me at the time: I just headed down the side path, eventually reaching the field with the cows and calves. I walked up to the fence, intending to climb the gate and walk across the field…when all of a sudden, the cows started marching over to me. I had a strange feeling they weren’t there to welcome me. By the time I got to the fence, a large gang of protective female cows were gazing at me. I tried to spook them, but they wouldn’t budge: they simply grunted at me, looking quite angry. I thought, “No chance am I getting trampled by cows during field work! I will just go around, because there’s another field next door.” I started to walk around to the side, watching the cows follow me out of the corner of my eye. I jumped the fence and started to make my way through some bushes (and brambles), regretting this choice but at the same time pretty sure it was better than cows trampling my head. At this point getting out was my main focus. I knew that when in mud like this, you need to expand your surface area in order not to sink. Unfortunately for me, this meant laying on my front and crawling out. I moved across the marshy land like a seal that had lost its way, until I finally made it out. At times like this, you either have to cry or laugh. I chose to laugh…until I left and realized that the cows were waiting for me like a trained animal retrieving a stick! I will leave you with the image I saw at this point, and I’m sure you can guess what happened next…squelch! 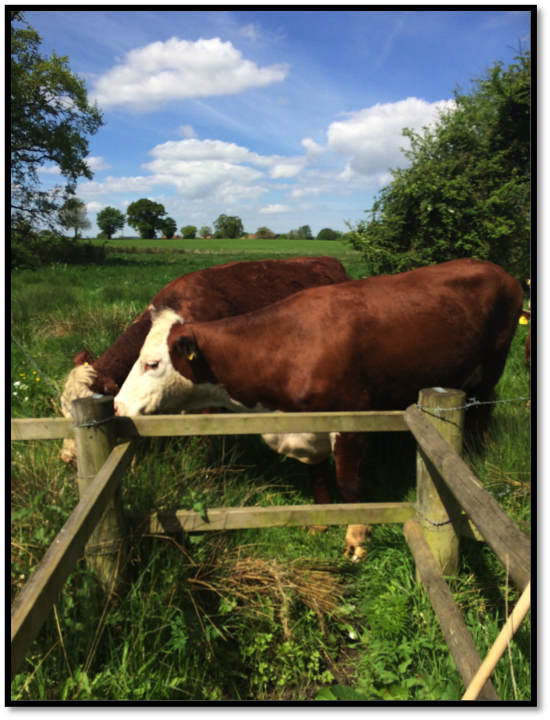 Field work offers rewards and excitement no other work can sometimes……Let’s not forget the cows! Arron is trained in field ecology, and has worked on a number of different research areas such as entomology, freshwater ecology, bat ecology, and the use of drones. He conducted an ecology and wildlife conservation degree at the University of Reading, went on to complete my masters by research in Entomology there also. He is currently working as a research assistant at the University of Reading and founder of a UAV consultancy called EcoDroneUK. One week before I officially started a Ph.D., I was already preparing to go into the field. Since I had done fieldwork in a bird colony before, I knew what to expect. I wasn’t fazed when my supervisor warned, “Make sure to bring clothes that you’re willing to get poop on, a wide brimmed hat so you don’t get poop on your face, and ear plugs.” Despite the common theme in his warnings, I was still overly stoked to be going back out to the field. I think one of the biggest perks of going into the field as a biologist is the chance to get your hands dirty. I was feeling confident about the fieldwork this time around. I had my bags packed – sunscreen (check! ), snacks (check! ), extra socks (check! ), and binoculars (check!). I was prepared and feeling good. The field team took the boat out for the first test ride of the season and everything went smoothly. All was fine. What possibly could go wrong? All the essential items for fieldwork. Especially the snacks – can never have enough! It was a beautiful day in late April. The wind was a little chilly, but nothing a few clothing layers couldn’t solve. The sun was shining, making the lake sparkle with an invitation to jump in. The colony we were headed towards was only just outside the harbour, which made for a very short boat ride to enjoy the weather but a long enough ride to bring my excitement to a peak. This colony was known to have one of the highest densities of nesting cormorants in Lake Erie, so there were bound to be enough nests with eggs for my project. Cormorants gather in the middle of the island. Finally, we grabbed the pelican cases that we would use to carry the eggs we collected and headed over the edge of the rock pile towards the centre of the island. As we approached the colony, the adults flew off their nests into the nearby water as they usually do. Only this time, when we looked at the nests they had just left, there were no eggs! Baffled, we spent several minutes observing the empty nests. There weren’t even any signs of broken egg shells, a normal result of predation. But then as we stood there, a small fox scurried right past our feet and through the cormorant nests to the other side of the island. “Well…that can’t be a good sign,” my supervisor said. With the empty egg cases in hand, we walked back to the water and started the process of reloading the boat. It is still a mystery what happened on that island. Was the fox able to steal and cache every egg that the cormorants laid? Or did the presence of the fox on the island scare the cormorants enough that they did not reproduce in the first place? All I know is the next time I need to go collect eggs, I should hire a fox as an assistant. This week, Dispatches from the Field is pleased to welcome fellow WordPress blogger Cindy Crosby. 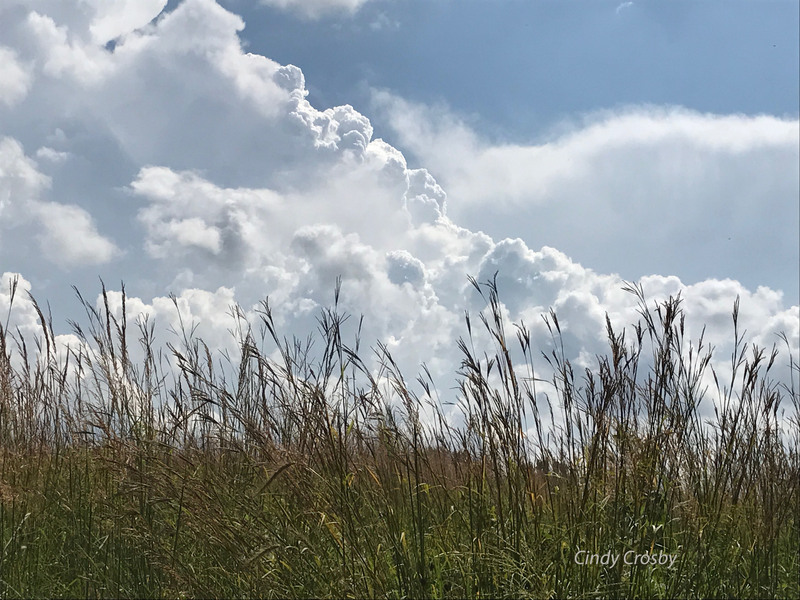 Cindy shares some of the lessons she’s learned from the landscape she loves most – the tallgrass prairie of Illinois. For more about Cindy, and to read more of her work, check out her bio at the end of the post. After a prescribed burn, the prairie may look a bit desolate. I heard this from a friend I took out to see the prairie where I serve as steward supervisor, expecting him to feel the same wonder and joy I experienced. Fieldwork—pulling weeds, managing invasives, collecting native prairie seeds, monitoring for dragonflies and damselflies—had brought me into a close relationship with the Illinois tallgrass prairie. This experience was a turning point for me in how I explained my fieldwork and passion for prairies and other natural areas to friends. I realized that without spending time there, family members and acquaintances couldn’t be expected to understand why I invested thousands of hours hiking, sweating, teaching, planning, and collecting data about a place that—on the surface—looks a bit wild and messy to the untrained eye. An eastern amberwing takes a momentary rest. Sure, visit the two prairies where I am a steward in the summer months, and it’s all eye candy. Regal fritillary butterflies and amberwing dragonflies jostle for position on butter-yellow prairie coreopsis, pale purple coneflowers, and silver-globed rattlesnake master. The bright green of the grasses stretches from horizon to horizon. 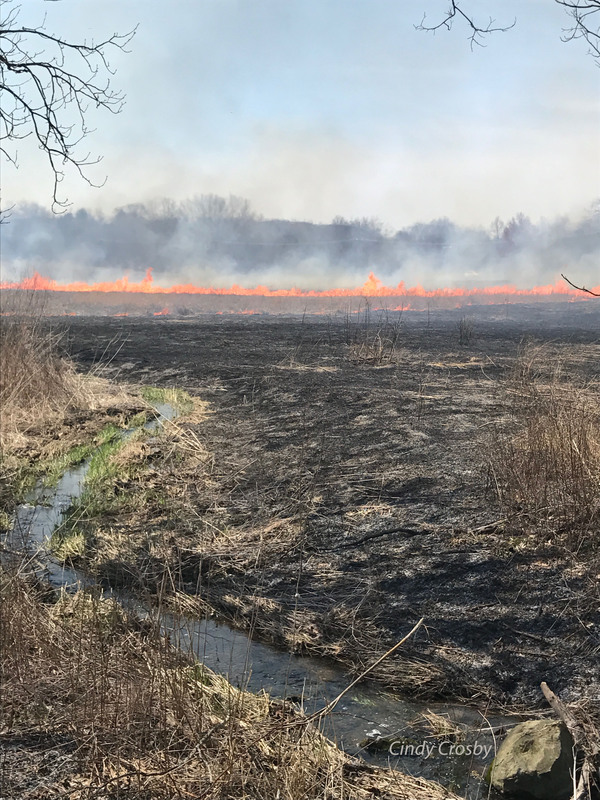 But drop in right after we do a prescribed burn in the spring, or in late winter, when the tallgrass is matted and drained of color, and yes… it doesn’t look like much. As someone who came later in life to fieldwork, I remember how it felt to only see “weeds” or “bugs.” I had the same questions. These questions remind me that I need to find different ways to connect hearts and minds with the places and critters I love. So—I train new dragonfly monitors each season to collect data. Then, I watch them fall in love with the prairie and its beautiful flying insects through walking a regular route. I work with my Tuesdays in the Tallgrass prairie volunteer group, and see men and women who have never seen a prairie before become deeply invested in its wellbeing. It’s all about showing up each week to do whatever task needs to be done. Seeing the prairie and its creatures in all sorts of weather, different seasons, and times of day. Reading a book about it. Taking a class. Building a relationship. Each person has a different connection to my fieldwork. For some, it’s the history of the prairie. 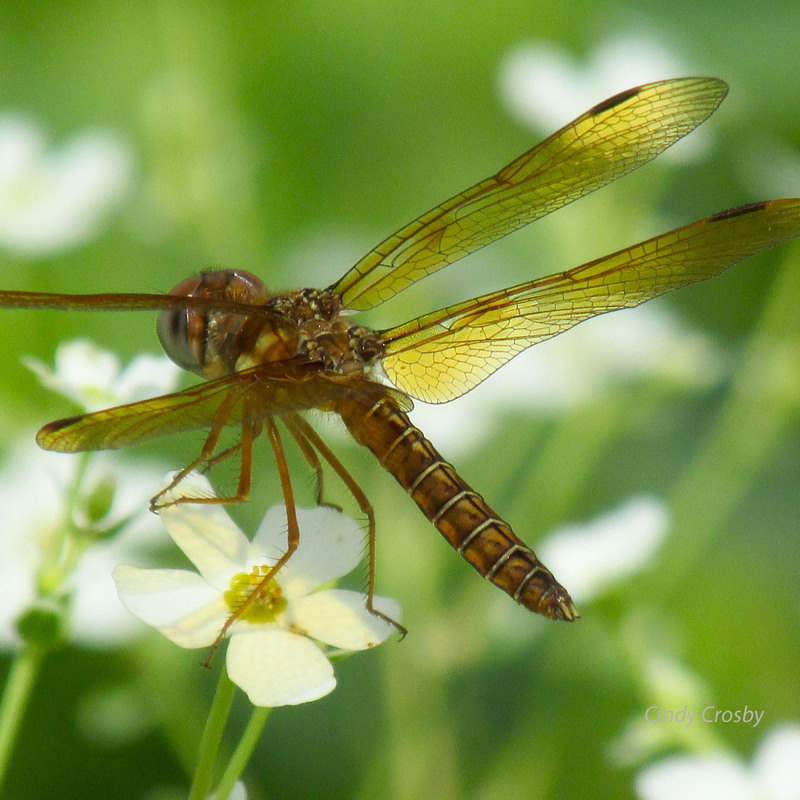 For others, it’s the amazing migration of some of our dragonflies. A few bring their cameras, and later write or paint about what they see. Some just like being outdoors and socializing in a natural environment. All good reasons. All points connecting to the restoration and science being done. Time well spent. The poet Mary Oliver reminds me: “Pay attention. Be astonished! Tell about it.” Fieldwork is all about paying attention, isn’t it? Keeping our sense of wonder. Then, building a relationship with a place or a creature. And relationships are about spending time with someone or something, then sharing what you love with others. Hoping, of course, that they’ll come to love the places you love too. Support the science. Change public policy because they care about the place they live. Building relationships. Taking care of my landscape of home. That’s what keeps me out there. Doing fieldwork. Cindy Crosby has authored, compiled, or contributed to more than 20 books, including The Tallgrass Prairie: An Introduction (Northwestern University Press, 2017). 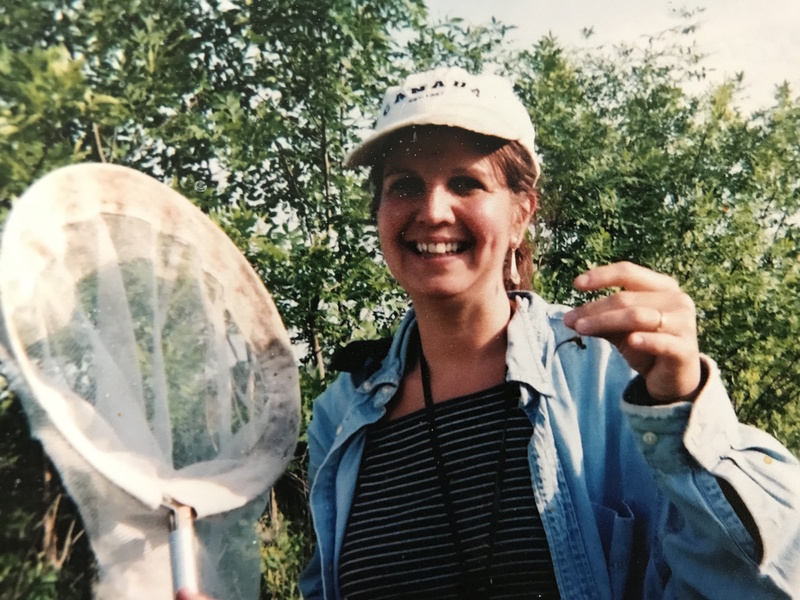 A prairie steward and dragonfly monitor, she blogs weekly on Tuesdays in the Tallgrass and speaks and teaches about the prairie and other natural history topics in the Chicago region. Read more at www.cindycrosby.com. This week, Dispatches from the Field is excited to welcome Rebecca Czaja, a recent graduate, to share her fieldwork story from her Masters project studying turtles in New York City (yes you heard her!). Check out the end of the post for more about Rebecca! Turtles in New York City? That’s the reaction I usually get when I explain my Masters research project. 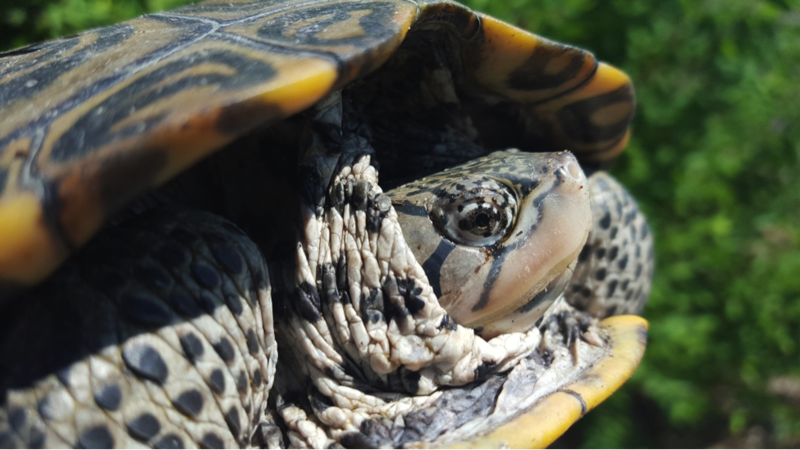 I worked with the Jamaica Bay Terrapin Research Project, which has been studying diamondback terrapins at Jamaica Bay Wildlife Refuge (JBWR) for almost 20 years. JBWR, which sits on the border between Queens and Brooklyn, is not only the nesting site for hundreds of terrapins but also an important habitat for migratory and resident birds, insects, and other reptiles. As part of a long term monitoring and conservation project, I was responsible for finding nesting terrapins, which are then collected to gather data such as weight and shell length. In addition, a protective cage is placed over the nests to prevent predation. Finding a nesting terrapin without scaring her off the nest requires a little bit of skill, good eyes (or binoculars), and a lot of luck. While a few terrapins are bold enough to nest right at your feet, most will abandon their attempt to nest if they see you. I can’t count the number of times I’ve found myself tiptoeing through thorny rose bushes or carefully kneeling in a field of poison ivy just to hide from a terrapin. The key is to stay out of sight until she’s laid her eggs, at which point she’ll finish burying the eggs even if you get too close for comfort. How do you know she’s done laying her eggs? She does a little dance. As she pushes dirt into the hole and pats it down, she appears to be doing a jig. A female diamondback terrapin collected after nesting. For my project, I focused on studying how precipitation impacts whether terrapin nests get eaten by raccoons. In addition to monitoring unprotected, natural nests for signs of predation, I also built and monitored over 200 artificial nests. There are a bunch of possible ways to build artificial nests. I picked the simplest method: dig a small hole and fill it back up. Even without any eggs or terrapin scent, raccoons were attracted to these nests. I also tried filling nests with terrapin-scented sand, which was made by putting a terrapin in a box full of sand for at least 20 minutes. Unfortunately, getting the sand to smell just enough like a natural nest is an imprecise science. The terrapin-scented artificial nests ended up smelling so strongly that raccoons tried to predate every single nest, rain or shine. But the beauty of science is you live and you learn. So I stuck with artificial nests filled with plain old sand. Ecology is the art of doing meaningful science with the simplest materials. 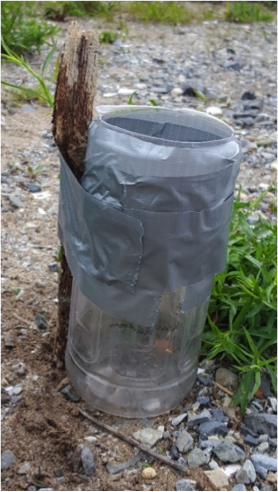 My rain gauges were made from plastic bottles washed up onshore, duct tape, and sticks. Doing research that depends on it raining at just the right time is nerve-wracking, to say the least. The month of June was unusually dry this summer, which left me constantly worried that I’d never get enough rain to finish the project. Especially because I not only needed it to rain, but to rain on a day when I had found a nesting terrapin. The first time it rained on a day when I had natural nests, I was ecstatic. The rain was unexpected, so I only had about an hour’s warning to hurry almost 1.5 miles across the park to place rain gauges at my nests. Fueled by my excitement, I got the rain gauges installed just in time. Of course, on the walk back I got soaked by the downpour and was chased by a Canada goose, but nothing was going to spoil my day! Terrapin nesting season lasts about two months at JBWR, and then come the hatchlings. Yes, they’re as cute as you’re imagining. Just like adult females, hatchlings are measured and weighed. I then cut out a small piece from the edge of their shell in a specific location so that if they’re recaptured as adults, we’ll know what year they hatched. The piece of shell will also be used for DNA analysis. Hatchlings are then released near their nest, where they either run for cover in some vegetation or make a break for the water. All we can do from that point on is hope we see them again when the females are old enough to nest! It’s amazing to think that less than a year ago I didn’t even know there were turtles in New York City. My Masters project taught me a lot: beach trash has endless uses, rain is unpredictable, and terrapins are much faster on land than you expect. But most importantly it reminded me each and every day of nature’s resilience. Watching a new cohort of terrapins hatch and make their way into Jamaica Bay’s marshes, despite pollution and habitat destruction, makes me optimistic that there’s still time to protect mother nature’s invaluable resources and beauty. 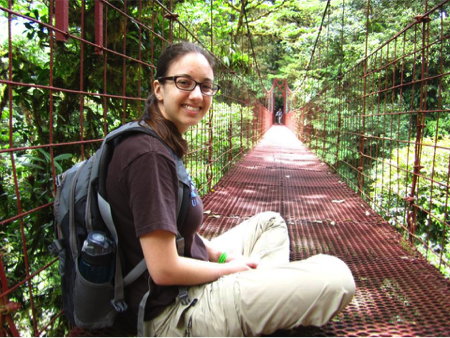 Rebecca Czaja recently completed her Masters in Marine Biology at Northeastern University. She conducted her Masters research project in Dr. Russell Burke’s lab at Hofstra University. She is also an alum of Tufts University, where she studied Biology and Environmental Studies. Light raindrops pattered against the tarp stretched above my head. Deep inside my tank top, t-shirt, long-sleeved shirt, sweatshirt, and jacket, I shivered. The damp cold of the day had made its way insidiously through my layers of clothing, freezing me from the inside out – and we had only been sitting here for two hours, meaning we had at least six more to go. I sighed, resigning myself to a(nother) cold, clammy, uncomfortable day. Most field biologists have spent at least a few days freezing their butts off in the field. Unfortunately for me, however, being cold is not something I’m particularly tolerant of. And in this case, the deep chill seeping into my bones was somewhat unexpected – because most people don’t go to Hawaii to be cold. As we’ve mentioned before on this blog, field biologists often get a unique perspective of the places where they work. So while bikini-clad tourists lay tanning on the beach less than 50 km away, I spent most of my time in Hawaii clad in at least three layers of clothing, huddled on the northeastern slopes of the Big Island’s tallest mountain, Mauna Kea. As it happens, Mauna Kea is not just the tallest mountain in Hawaii – it is, in fact, the tallest mountain in the world (depending on how you look at it). From its base on the sea floor, it rises over 33,000 feet – almost 1,000 feet higher than Mt. Everest. Of course, only 13,802 of those feet actually rise above the surface of the ocean – but it’s still a lot colder at thirteen thousand feet in the air than it is at sea level. 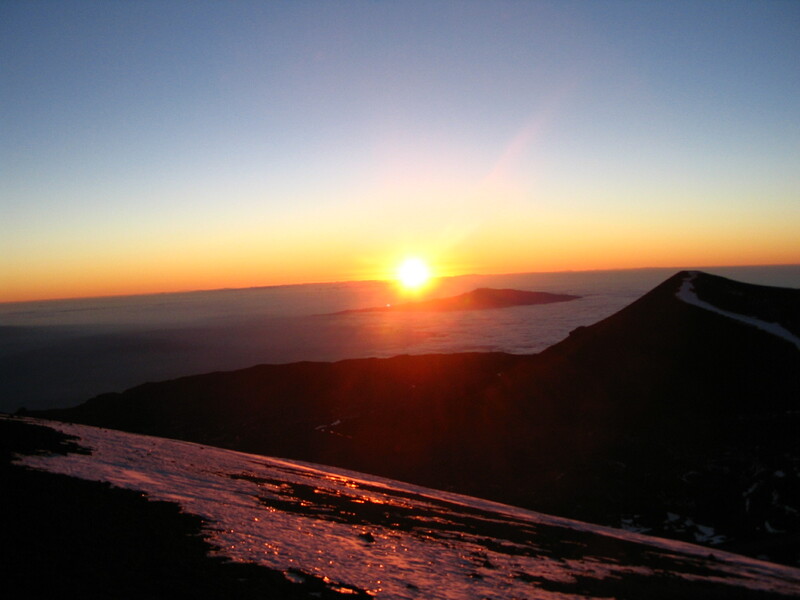 The top of Mauna Kea is frequently snow-covered in winter, and spending a rainy day hanging out on its slopes can be a chilly experience. Watching the sunset from the top of Mauna Kea. However, while the damp, misty chill of the Hawaiian forest was perhaps not ideal for field biologists (at least, not for me), it turns out that it’s pretty important for the organisms we were there to study: the birds. I went to Hakalau to work as a field assistant on a long-term study examining population trends of Hawaiian forest birds. 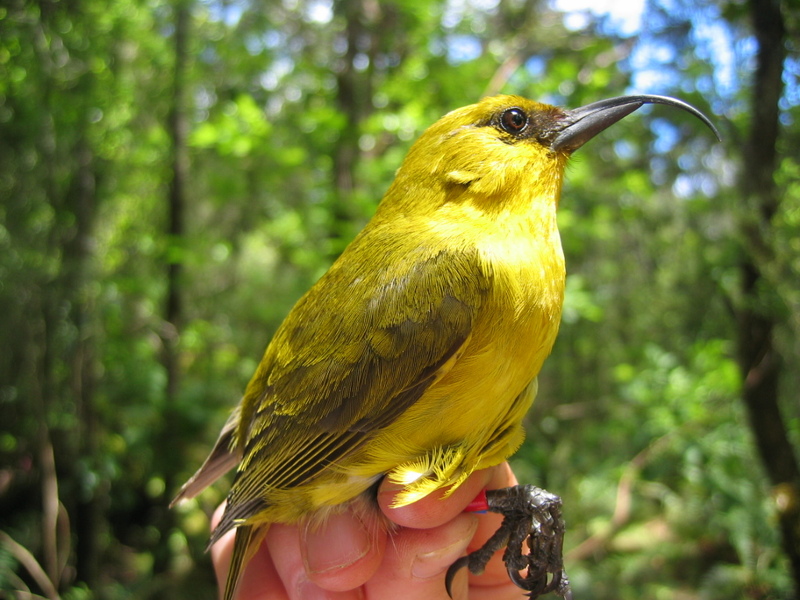 Although just about anyone would be excited to be spending the winter months in Hawaii, I was excited for an entirely different reason than most people: Hawaiian honeycreepers are one of the poster children of adaptive radiation. An ‘akiapola’au shows off his amazing, multi-purpose bill. Arising from a single, unspecialized ancestor species, Hawaiian honeycreeper species have exploded to fill multiple ecological niches on the islands. There are finch-like honeycreepers and parrot-like honeycreepers and warbler-like honeycreepers. And then there’s my particular favourite: the ‘akiapola’au – which we nicknamed the ‘Swiss Army knife bird’. ‘Akis fill the woodpecker niche in the Hawaiian forest. They use their straight, strong lower bills to drill holes in tree bark, and their long, curved upper bills to probe those holes for insect larvae. With their striking scarlet and black plumage, ‘i’iwis are hard to miss. It’s one thing to learn about adaptive radiation in a lecture hall…but quite another to see its results, firsthand, in the field. Honeycreepers may not be the quintessential example of adaptive radiation – that honour being reserved for Darwin’s Galapagos finches – but they are (with all due respect to Darwin) definitely one of the most dazzling. My first day at Hakalau, I was constantly distracted by flashes of colour, as the deep scarlet of an ‘i‘iwi or the bright orange of an ‘akepa flitted through the nearby ‘ohi‘a trees. Seeing their endless, beautiful forms brought evolution to life for me in a way that four years of undergraduate biology textbooks never had. Unfortunately, however, Hawaiian birds are not just the poster child for adaptive radiation. They could also be featured on posters for another buzzword concept in biology: multiple stressors. Hawaiian birds are currently under attack from every side…and, more often than not, they’re losing the fight. The plight of Hawaii’s forest birds started – as these stories so often do – when humans showed up, changing habitats and trailing with us the usual host of desired and not-so-desired biological companions. From rats and house cats to feral pigs, non-native bird species, and mosquitoes, humans unleashed (sometimes intentionally, but more often unintentionally) a tidal wave of invasive species that swamped the delicate balance of life on the remote Hawaiian islands. While each of these invasive species individually has a negative effect on Hawaii’s native birds, it’s in concert with each other that they become especially dangerous. Some of the introduced bird species on the island arrived there carrying avian malaria, a blood parasite that is relatively common in most places, but foreign to Hawaii. The introduced mosquitoes acted as vectors to transfer that parasite to the native birds – which had never been exposed to it, and hence were completely lacking any defences. Even the feral pigs got in on the act, digging up roots in the forest and inadvertently creating hollows which filled with water, providing ideal breeding sites for mosquitoes. It’s a multi-pronged attack, and one that has resulted in the decimation of many of Hawaii’s native bird species. 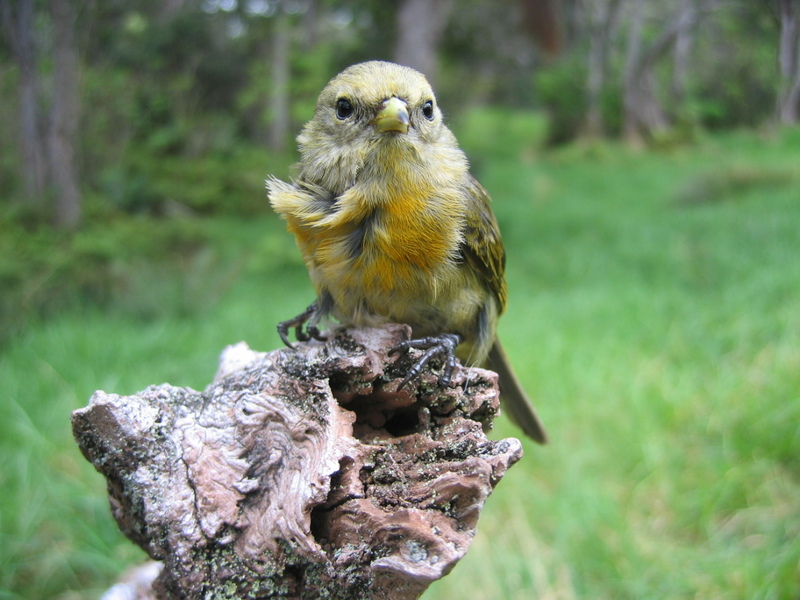 But these native birds do have one thing going for them – the cold. Mosquitoes are largely restricted to low elevation areas of the islands (~5000 feet), as their larvae don’t develop properly at the lower temperatures found further up the slopes. 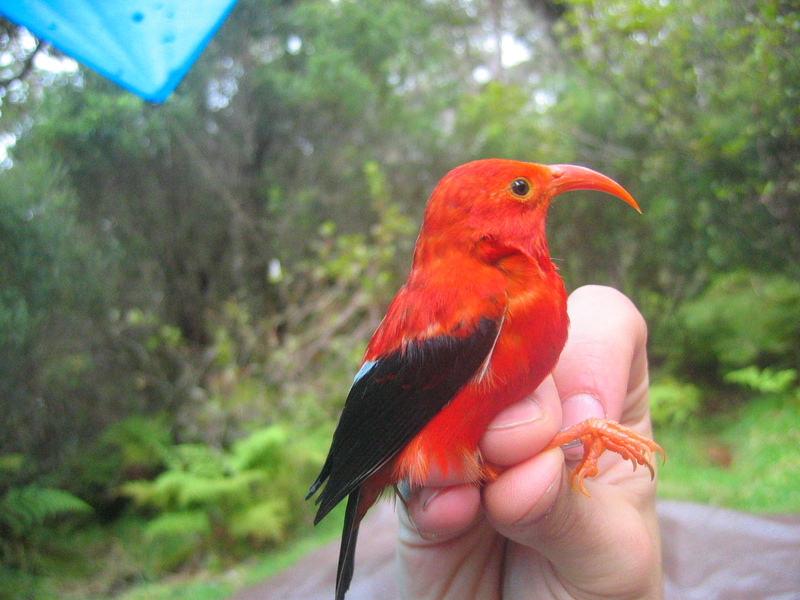 So high elevation forests, like those found at Hakalau, have for decades acted as refuges for Hawaiian honeycreepers. And therein lies yet another problem: we all know, as the climate warms, that cold places will not necessarily stay cold. In Hawaii, climate change is yet another stressor for the birds. Increasing temperatures will likely mean the end of these high altitude refuges, and even more dramatic declines in honeycreeper populations, as has been documented in recent studies on the island of Kaua’i. Slowing the rate of climate change may be the only hope for some of these already beleaguered species. As I’ve already mentioned, I’m not very good at being cold – in fact, it makes me decidedly grumpy. But while I was in Hawaii, watching an ‘i‘iwi feed on the bright pink flowers of an ‘ohi‘a or an ‘akiapola’au hammering holes in the bark of a koa tree more than made up for the damp chill. Without the cold, I might never have had the chance to see these spectacular and declining species. That realization alone was enough to make me almost appreciate the shivering…except perhaps for the day I caught my sleeve on fire. An endangered Hawaii ‘akepa perches on a convenient branch after banding. In honour of Canada Day, we wanted to highlighted some of the cool, interesting, funny, or neat stories about fieldwork in Canada that we have shared on Dispatches from the Field over the years. Our blog tells stories from fieldwork happening all across the country, and also across many different species. We do truly live in a great country – check out these blogs for yourself! and Krista C. shares her adventures in the Land of Living Skies in Grasslands National Park, Saskatchewan. From the great white North, Michelle V. explains how she prepared for polar bear fieldwork. Julia C. and Rachael H. share their hilarious (sorry Julia) beaver story from the Muskoka region of Ontario where they almost flip the canoe, while Melanie S. explains how help is always where you least expect it. 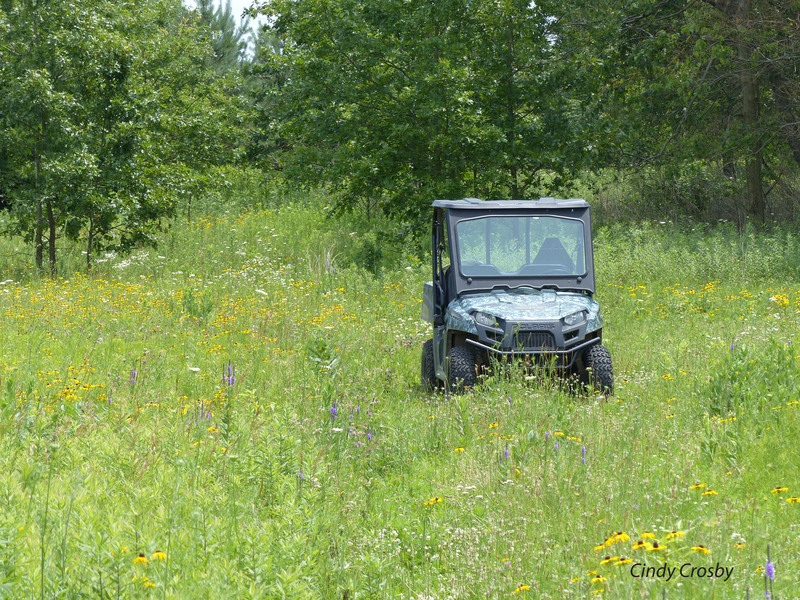 Southern Ontario is quite busy with field biologists, with Jenna S. running around in fields chasing butterflies, Toby T. listening for what the bat said, and Amanda X. searching for snakes on a [fragmented] plain. Liz P. plays hide and go seek with whip-poor-wills, and Adam M. creates robots for sampling daphnia. As we head to the east coast, Michelle L. shares what it is like to collect salmon eggs in New Brunswick…in the winter. This week we are very excited to welcome our good friend Alex Ross to the blog. Alex just completed his MSc in the Department of Biology at Queen’s University and today he tells us all about his adventures sampling lakes in the Muskoka region. For more about Alex see the end of this blog. To me, taking a job that would keep me outside and, better yet, in a canoe, sounded like a dream. Growing up I spent many summer days fishing from an old beat up cedar strip canoe at a family cottage. Subsequently I spent the better part of 5 summers during my teen years and early twenties guiding canoe trips for summer camps all over Ontario and Quebec. I knew that eventually I would need a “real” job, but when I heard of an opportunity to be part of a team surveying 135 lakes in the Muskoka region I thought, great! A real job can wait a year. Little did I know that not only was this a very “real” job, but also a gateway to a career that could keep me outdoors for good. The project itself aimed to document new establishments of an invasive aquatic invertebrate, Bythotrephes longimanis, or as it’s more well known, the spiny water flea. Coming to the Great Lakes via ballast water from ocean-going ships, these tiny invaders have since spread to hundreds of inland lakes in Canada and the United States. Largely a result from transfer by recreational boaters, secondary invasions of the spiny water flea to inland lakes have unfortunately left a trail of ecological impacts in their wake. A primary goal of our work during the summer of 2010 was to establish a model that could be used for predicting where new invasions were likely to occur. As such, our survey took us to some very remote lakes with a low likelihood of invasion, as well as some very developed lakes with a high likelihood of invasion. After getting our feet wet and confidence up by sampling lakes with relatively easy access, my field partner, Julie, and I decided to pick a lake off the beaten path, so much so that it didn’t have a name. We pulled up satellite images and old topographical maps of our lake’s location, determined where the closest road to it was and formed our plan of attack for access. The maps showed a meandering stream that led to a forested area where we could make a short portage to hop into the lake – no problem! Well, when we arrived at the stream what we found was much more “bog”, than stream. Undeterred, we set out but eventually discovered that our stream had all but dried up and that we were woefully unequipped to make it any farther. Looping back, we hopped in our vehicle and started down an unmaintained ATV trail in hopes of getting close enough to hike in the rest of the way. Next obstacle – stuck in the mud! After a good hour spent freeing our vehicle, and with the day getting late we turned around and decided that getting to this lake might have to wait for another day. Fast-forward a month or so, and with a new plan in mind, Julie and I set out to conquer this lake, once and for all! With hip waders in tow we set back out and launched our canoe into the stream. Similar to our first attempt, it wasn’t long after putting it in that we came to a point where the water was all but absorbed by wetland sedges, flowers, and muck. Once the stream became un-navigable it was time to get creative. Waist-high mud made us perform a rather uncoordinated combination of poling ourselves ahead with our paddles, and hopping out of the canoe to pull, and push it forward in increments of what seemed like an inch at a time. Unfortunately, there are no photos of this process but if you can imagine two people in the middle of nowhere, literally stuck in mud – that was us. Along with that, place a chorus of delirious laughter and excessive swearing that only the smaller creatures in our midst were privy to – I’m sure that many reading this have found themselves in identical situations. Once the ground firmed up, slightly, we continued pulling our canoe through thick brush and shrubs, receiving the odd scrape to the arm or poke in the eye by an errant branch. Finally on solid ground and with our lake at the top of a ridge we carried our canoe and all of our sampling gear up a steep slope to finally get a glimpse at the lake that had eluded us for so long. The lake itself was essentially a beaver pond, shallow and no larger than a few swimming pools in size. Although many would consider this no more than a puddle, I cannot think of a more triumphant and accomplished feeling that entire summer than finally launching our canoe into this unnamed lake. As Julie and I found out, “lake” sampling often involved much more than calm sunny days on the water. However, we are happy to report that, at least on this day – the spiny water flea had not invaded our stubborn, secluded lake. Alex Ross is currently working as a research technician at McGill University in an aquatic ecology lab, working on a fish conservation project with the Nature Conservancy of Canada. Alex’s research interests lie in understanding how aquatic communities and ecosystems respond to environmental change. His Masters project looked at understanding biological recovery of acidified lakes facing emerging stressors.